The cups have a PLA inner lining, allowing them to be commercially composted. 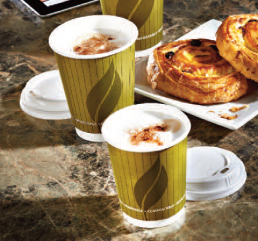 The environmental benefits of the cups are incorporated into the design, with the key words printed clearly around the cup…sustainable, renewable, compostable and biodegradable. These cups are also recyclable. Sipper domed lids are available to fit the cups, made from CPLA compostable lids.